Richard Dawkins has 6 media appearances. Evolutionary Biologist; Author, The Selfish Gene, The God Delusion and An Appetite for Wonder: The Making of a Scientist; Twitter @RichardDawkins Richard Dawkins has been central to the debates surrounding creationism, intelligent design and religion. He coined the word meme, and his gene-centric view of evolution helped popularize the radical new understanding of Darwinism. From his early childhood in Africa to his educational awakening at Oxford, Dawkins shares his personal experiences that shaped his remarkable life and intellectual development. Richard Dawkins has been central to the debates surrounding creationism, intelligent design and religion. He coined the word meme, and his gene-centric view of Evolution helped popularize the radical new understanding of Darwinism. His new book is a memoir covering his early life in colonial Kenya, his intellectual awakening at Oxford, and the creation of his books and philosophy. Tickets are available now online at Brown Paper Tickets. Tickets will be available at Kepler's soon. An Appetite for Wonder is slated for release on September 24. By purchasing your ticket and book together, you’re securing a copy of the book a full day before its worldwide release. Your book (retail value $27.99) is included in the special ticket price of $40, and will be signed by the author following an evening of discussion and Q&A. Tickets available through the BAM box office or online at BAM.org. Pickford Film Center & Village Books present "Writers in the Limelight." Join us for the screening of lectures and presentations from some of the most celebrated voices in the humanities, arts, and sciences. Watch author Richard Dawkins discuss his book, THE GREATEST SHOW ON EARTH: The Evidence for Evolution, in this special movie showing at the Pickford Limelight Cinema. (Author is not attending this event). We will have a Village Books hosted discussion after the showing. Richard Dawkins, an evolutionary biologist and unapologetic atheist uses scientific evidence to argue the case for evolution in his book THE GREATEST SHOW ON EARTH. This on-screen author talk will be showing at the Pickford Film Center's Limelight Cinema. Tickets are available through the Pickford Film Center. Village Books will provide books for sale at the event. Richard Dawkins discusses The Greatest Show on Earth: The Evidence for Evolution. 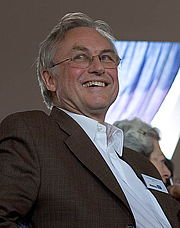 Richard Dawkins is an evolutionary biologist, ethologist, public advocate of atheism, and outspoken critic of religion. His written works generally revolve around evolution and genetics (Selfish Gene; Extended Phenotype) and/or atheism/religious skepticism (The God Delusion; The Blind Watchmaker). Dawkins has won numerous scholarly and literary prizes and awards, and has lectured at many institutions. He is currently married to actress and illustrator Lalla Ward, who is credited with illustrating many of his books, including The God Delusion. In his first book, The Selfish Gene, Dawkins coined the term 'meme' to identify ideas and practices which are transfered, adapted, and changed within a society. Richard Dawkins's book Candidate Without a Prayer: An Autobiography of a Jewish Atheist in the Bible Belt was available from LibraryThing Early Reviewers. Richard Dawkins is currently considered a "single author." If one or more works are by a distinct, homonymous authors, go ahead and split the author. Richard Dawkins is composed of 32 names. You can examine and separate out names.